Make brownie batter as directed on box. Stir in peanuts. Spread in pan. Place 24 Reese's™ peanut butter cups in single layer 6 rows by 4 rows on top of batter. Bake 35 to 38 minutes or until toothpick inserted 2 inches from side of pan comes out almost clean. Transfer to cooling rack to cool completely, about 1 hour. Spread both pouches of frosting (from both brownie boxes) evenly on top of brownie. Drizzle with caramel sauce. Sprinkle chopped Snickers™ and peanut butter cups over top. Change it up! 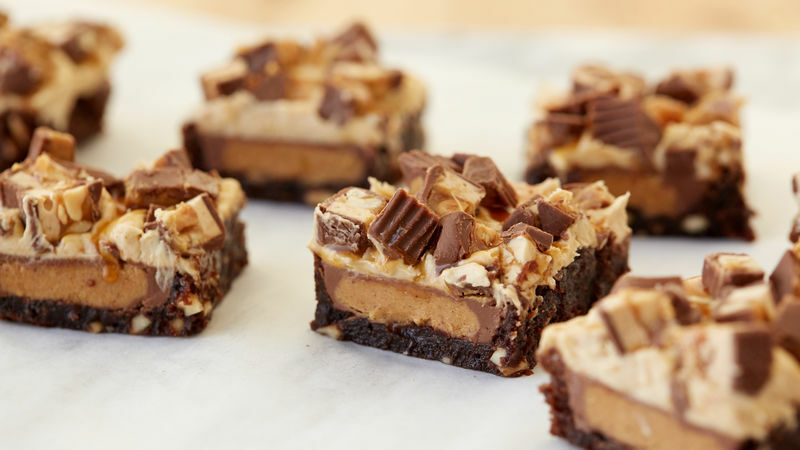 Top the brownie with your favourite candy bar for a new flavour twist!